A fully soluble fertiliser comprising potassium and phosphorous, recommended for vegetables, fruits, vines, flowers, turf and ornamentals. 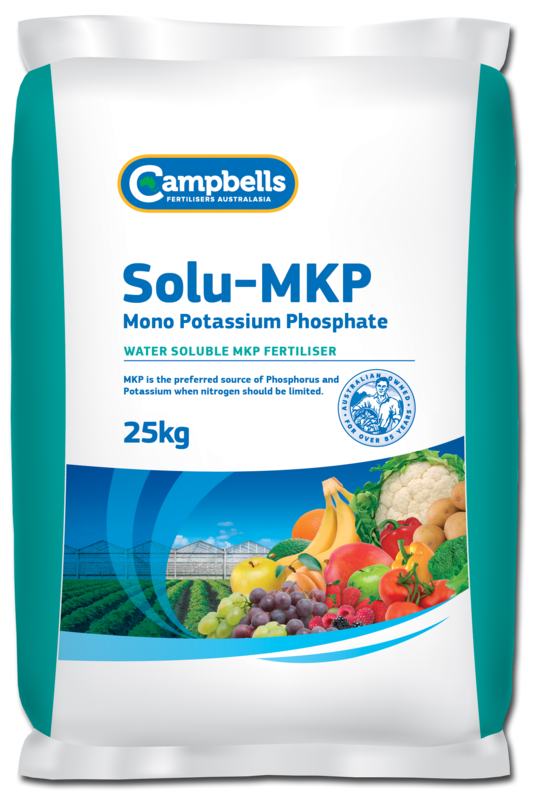 Campbells Solu-MKP Technical Grade is a fully water soluble fertiliser, containing two essential elements for your crops development, providing immediately available potassium and phosphorous. Mono Potassium Phosphate is the most readily available fertiliser form of potassium and phosphorous available. As a nitrogen free fertiliser, Mono Potassium Phosphate is the preferred source of phosphorous and potassium when nitrogen should be limited. Campbells Solu-MKP is suitable for application via irrigation systems on any growing medium and can be used for foliar spraying when a quick response is required. General fertigation rates for horticultural crops are between 25 to 70 kg/ha. When applying Mono Ammonium Phosphate through the irrigation system more frequent and smaller applications guarantee the nutrients are supplied to the plants without being lost due leaching or excessive rainfall. Foliar applications are recommended at a concentration of 0.5-1.0%. The actual rates, number of applications and their timing will vary considerably for different crops and for different districts. Before application, seek advice from your Campbell’s Solu-MKP distributor or your local agronomist.